April 2017 NPTE Results are out! Congratulations Dragons! SRG Continues to bring quality education and redefine the review industry across the globe. 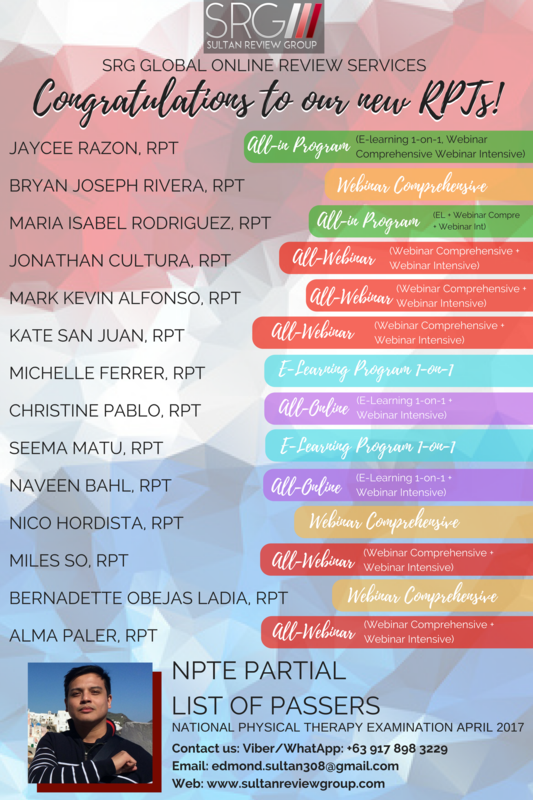 Here is the partial list of April NPTE passers from different review programs of SRG as another proof that we definitely deliver the desired results. Sultan Review Group proudly congratulates all the April NPTE passers! Congratulations and thank you for entrusting your dream to us! The Worldwide webinar season 6 is on its way! Experience the review program that produced successful passers. Enroll now and be part of the growing family of our international exam passers! Previous Entry:Season 6 of the Worldwide Webinar Review for PCE! Next Entry:14 days left until the 6th Season of the Worldwide Comprehensive Review for NPTE, NPTAE and PCE!